On a beautiful late spring afternoon, this past year, a young woman received the devastating news. She had just gotten back her result on the Occupational Therapy test. It was not what she had hoped for. In fact, it was not even close to the expectations she had considering her past experience and educational background. Unfortunately, this hypothetical situation occurs all the time. Someone thought they were going to breeze through the examination, told all their friends, made plans for their future, and then got an embarrassing reality check from the Occupational Therapy test. The Certified Occupational Therapy Assistant (COTA) Examination and the Occupational Therapist Registered (OTR) Examination are quite simply an objective assessment of a test taker's requisite foundation of knowledge and skills. Occupational Therapy test scores are used by the National Board for Certification in Occupational Therapy (NBCOT) as a uniform standard of qualification. While it may not be fair, all of a person's plans for the future may be dependent upon needing a certain Occupational Therapy test score. That is the whole purpose of the Occupational Therapy Exam Secrets study guide: to give test takers the keys to understand how to succeed on the Occupational Therapy test. If you'd like to get the Occupational Therapy test score you deserve, to quit worrying about whether your score on the Occupational Therapy test is good enough, and to beat the test taking game so you can become a Certified Occupational Therapy Assistant (COTA) or Occupational Therapist Registered (OTR), then this might be the most important message you read this year. Our comprehensive study guide for the Certified Occupational Therapy Assistant (COTA) Exam and the Occupational Therapist Registered (OTR) Exam is written by our test experts, who painstakingly researched the topics and the concepts that you need to know to do your best on the NBCOT-OTR Exam or the NBCOT-COTA Exam. 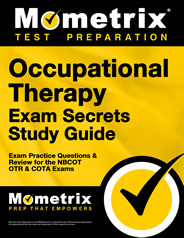 Our original research into the Certified Occupational Therapy Assistant (COTA) Examination and the Occupational Therapist Registered (OTR) Examination, offered by the National Board for Certification in Occupational Therapy (NBCOT), reveals the specific content areas and the essential skills that are critical for you to know on the Occupational Therapy test. We've taken the information and developed a study guide that is guaranteed to help you be successful on the Occupational Therapy test. Our company's name is Mometrix Test Preparation, and we have a team of standardized test researchers who have worked on developing our study guide for the Occupational Therapy test. The standards for who gets to work on the team are very strict. We demand the best for our customers, and only those who met our exacting standards made the cut. The dedicated research staff have years of combined experience in mastering the content and skills necessary to succeed on the toughest exams. Some academic studies have revealed that test takers do not really benefit from the traditional test preparation process. But we knew there had to be a solution. If test takers were not doing well on the Occupational Therapy test despite high intelligence, there had to be a set of secret keys to the test that would open the door of success for these test takers. We created the product in part because we were frustrated by the options available to test takers who really wanted to do well on the Occupational Therapy test. A common approach is to TEACH the material, instead of TEACHING THE TEST. That's not necessarily good enough for the Occupational Therapy test. You have to know how to apply the knowledge. Most test takers already have a general knowledge of the material that will be covered on the exam. One reason some test takers do well on the day of the test is that they have made the critical connection between the material they learned and how to use the material to succeed on the Occupational Therapy test. Details the EXACT STUDY PLAN for the Occupational Therapy test that we believe gives the most results in the least time. No matter if you're studying for a week or a month, you won't waste the precious study time you have on useless activities. Before we go any further, let us clarify what Occupational Therapy Exam Secrets is not. It is not a stale rehash of all of the things you have already learned in the past. Occupational Therapy Exam Secrets is our exclusive collection of the tips and the information that we have specially selected to give you the best results on the Occupational Therapy test for the least time spent studying. It's written in everyday language and is easy to use. We cover the essential skills necessary to do well on the Occupational Therapy test, plus comprehensive reviews covering all of the essential test sections individually. I purchased the Secrets file, and I just wanted to let you know that I aced my test. I just want to thank you again, and hope you have continued success in your ventures. Sincerely, Paul L.
One: The guide must be written by writers who have painstakingly researched the topics and concepts needed to succeed on the Occupational Therapy test. The blind cannot hope to lead the blind. Occupational Therapy Exam Practice Test Questions: Think you're ready for the Occupational Therapy test? Test yourself using our practice test questions. Find out if you're prepared or if you need to head back to the study guide for another review. Use our practice test questions to make sure that you're not caught off guard on the day of the test! Our Occupational Therapy practice test questions give you the opportunity to test your knowledge on a set of questions. You can know everything that is going to be covered on the test and it will not do you any good on the day of the test if you have not had a chance to practice. Repetition is the key to success and using the practice test questions allows you to reinforce the strengths you already have, while improving the weaknesses that you need to overcome. Detailed answer explanations are included for the questions. It may sound obvious, but you have to know which questions you missed (and more importantly why you missed the question) to be able to avoid making the same mistakes again when you take the real test. That's why the practice test questions we include for the Occupational Therapy test include answer keys with detailed answer explanations to each question. The in-depth answer explanations will allow you to better understand the questions that were difficult for you or that you needed more help to understand. Study Skills teaches you everything you need to know about studying, so that you can maximize the effectiveness of the time you spend in preparation; the techniques provided are guaranteed to get you the results you deserve on the day of the test. Study Skills is the most in-depth, comprehensive study manual available and is completely free with the purchase of Occupational Therapy Exam Secrets. Musculature/Innervation Review: Could you still name the origin and insertion of all the major muscles? How about the Pectoralis Major? Use our exclusive musculature and innervation review to prepare for your medical career. This information will be an excellent resource for reviewing anatomical associations between muscles, bone, and nerves. Myotome and Dermatome Screening Reference: Allows you to assess orthopedic patients and determine the spinal cord level of dysfunction. These are commonly missed questions on the Occupational Therapy test and so we help strengthen this area of your knowledge. Handling Difficult Patients: Every therapist will eventually get a difficult patient on their list of responsibilities. These patients can be mentally, physically, and emotionally combative in many different environments. Consequently, care of these patients should be conducted in a manner for personal and self-protection of the therapist. We provide you with a list of guidelines to use when handling these difficult patients. Standard Precautions: Standard precautions are the precautions taken to avoid contracting various diseases and to prevent the spread of disease to those who have compromised immunity. These universal precautions are needed since many diseases do not display signs or symptoms in their early stages and should be used with all patients. Make sure you are up to date on all of these precautions which could help protect you against diseases such as human immunodeficiency virus (HIV), acquired immunodeficiency syndrome (AIDS), and hepatitis B (HBV). CPR Review/Cheat Sheet: Do you know the rate or the depth of compression for an infant? Use our quick review/cheat sheet to make sure that you don't forget the critical CPR information that you might need to know sooner than you think. Every professional in the medical field needs to know CPR. Reduce study time by using our CPR Review guide and increase your level of preparation for the medical emergencies you may have to face. High Frequency Medical Terminology: This includes our exclusive collection of medical terminology definitions and abbreviations that frequently appear on the Occupational Therapy test, along with an in-depth review of the prefixes, suffixes, and root words that make up most of our modern medical vocabulary: even if you don't recognize a word, you'll be equipped to decipher its meaning. Use our list of high frequency terms to help focus your study time so you won't get caught off-guard with terminology you may not have thought about reviewing. Lesion Chart Review: Utilizes key signs and symptoms to help you remember the specific neurological lesion location in the brain. This is a valuable quick reference chart that keeps you from making typical mistakes. We insist that you order Occupational Therapy Exam Secrets entirely at our risk. That's why when you order from this site it comes with a Risk-Free, 1-year 100% Money-Back Guarantee. There's absolutely NO RISK on your part. Why are we going to such great lengths? So go ahead and order your copy of Occupational Therapy Exam Secrets today. Take the time to read it, use it, and profit from it. If you use any one of our secrets, and somehow fail to recoup your small investment in the form of the test result you want, send us an email at support@mometrix.com to arrange a 100% refund of the product price. Occupational Therapy Exam Secrets can be ordered directly from this site. A printed copy will typically ship within one business day from our shipping facility. Or, if you prefer, you can order the study guide as an instantly downloadable ebook. It doesn't require any special software. If you can read this web page, you have all you need to start using and applying Occupational Therapy Exam Secrets in just five minutes. You don't have to wait for anything to come in the mail. Download Occupational Therapy Exam Secrets immediately! It's easy to order your copy of Occupational Therapy Exam Secrets. These comprehensive packages retail for $89.99 or more, but are available to you today starting at the incredibly low price of $49.99. Just click one of the links below. If you would like to order through the mail, click here to order Occupational Therapy Exam Secrets study guide by check or money order. *NBCOT® is a registered trademark of the National Board for Certification in Occupational Therapy, Inc., which administers the NBCOT® exam. NBCOT does not endorse and is not affiliated in any way with Mometrix or its products and services.